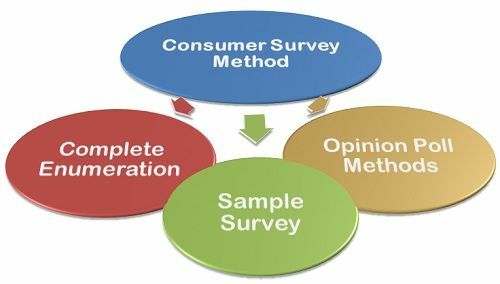 Definition: Consumer Survey Method is one of the techniques of demand forecasting that involves direct interview of the potential consumers. Where, Q1, Q2, Q3 denote the demand indicated by children 1, 2,3 and so on. One of the major limitations of this method is that it can only be applied where the consumers are concentrated in a certain region or locality. And if the population is widely dispersed, then it can turn out to be very costly. Besides this, the other limitation is that the consumers might not know their actual demand in future. Due to this, they may give a hypothetical answer that may be biased according to their own expectations regarding the market conditions. Where Dp = probable demand forecast; H = Census number of households from the relevant market; Hs = number of households surveyed or sample households; HR = Number of households reporting demand for a product; AD = Average Expected consumption by the reporting households (total quantity consumed by the reporting households/ Number of households. This method is simple, less costly and even less time-consuming as compared to the comprehensive survey methods. The sample Survey method is often used to estimate a short-run demand of business firms, households, government agencies who plan their future purchases. However, the major limitation of this method is that a forecaster cannot attribute more reliability to the forecast than warranted. End-use Method: The end-use method is mainly used to forecast the demand for inputs. This method of demand forecasting has a considerable theoretical and practical value. Under this method, a forecaster builds the schedule of probable aggregate future demand for inputs by consuming industries and several other sectors. In this method, during the estimation of a demand the changes in technological, structural and other factors that influence the demand is taken into the consideration. The end-use method helps in determining the future demand for an industrial product in details by type and size. Also, with the help of end-use method, a forecaster can pinpoint or trace at any time in the future as to where, why and how the actual consumption has been deviated from the estimated demand. Thus, these are some of the most commonly used consumer survey methods, wherein the customers are directly asked about their intentions about the product and their future purchase plans.